Among the leading health concerns of those who fly each year on commercial airliners is catching colds while flying. Research has shown that the practice of recycling cabin air spreads germs that cause contagion, spreading such viruses as influenza and the common cold. Victoria Knight-McDowell, an elementary school teacher who was sick of catching colds on airplanes spent over five years developing Airborne with a team of health professionals. By combining seven Chinese herbs* (each with a specific function in Eastern medicine), putting them through a patented extraction process, and combining them with a unique formulation of amino acids, antioxidants and electrolytes, the Airborne development team believe they have created a product that helps support and protect immune system function against airborne germs and viruses. They use an effervescent carrier as a way to deliver the nutritional benefits of Airborne to the system. Organic Herbal Extracts (Lonicera, Forsythia, Schizonepeta, Ginger, Chinese Vitex, Isatis Root, Echinacea) 350mg (DV*), Amino Acids (Glutamine, Lysine) 50mg (DV*). Other Ingredients: Citric Acid, Sorbitol, Sodium Bicarbonate, Natural Orange Flavor, Polyethylene Glycol, Aspartame, Mineral & Canola Oil, Riboflavin. "Now that space-age technology has made it increasingly feasible to fly hundreds of people quickly from city to remote city, some hazards relating to airline travel have recently been identified...More likely, however, is the spread of respiratory infections...In general the worst-case scenario may be the air-travel-related transmission of respiratory pathogens that are commonly spread by tiny droplet nuclei. Such droplet nuclei are dispersed widely and randomly (and) remain airborne for hours." New England Journal of Medicine. Editorial, 'Airline Travel And Infection.’ April 11, 1996. Vol 334 No. 15. "Have you ever considered the health risk that you take every time you take your seat on an airplane?... Recirculated air often contains viruses and bacteria exhaled by passengers flying with you, increasing your exposure to these contaminants... No standard currently exists for ambient air quality on commercial flights." Congressman Jerrold Nadler (D-NY), co-sponsor of the "The Safe Cabin Air Quality Act." Wash. D.C. 1997. "The crucial question becomes, "Just How Sick IS Too Sick To Fly?" The answer is governed by federal regulations and individual policies of the airlines.... But in a clarification of these regulations published Nov 1 in the Federal Register, the common cold was singled out as an example of a condition not serious enough to warrant restrictions." LA Times, February 23, 1997, Travel, Part L, Page 8; "Just How Sick Is Too Sick To Fly?" 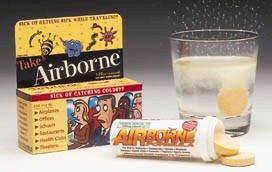 "There is an urgent need for studies of potentially infectious airborne agents under routine flight conditions... The risk of contacting epidemic disease on a grounded aircraft is emphasized by a report of an epidemic of influenza directly traceable to a passenger aboard a plane grounded for four hours in Alaska; 72% of the passengers became ill from the exposure*." National Research Council, "The Airliner Cabin Environment." National Academy Press. 1986. *American Journal Epidemiology. 110:1-6, 1979. "...And pumping more fresh air into the cabin won't make a difference... critics charge that the system cannot possibly filter out all the viruses that could cause passenger illness. "Viral particles are so small that it is plainly ridiculous to suggest that you could filter them out." Dr. Richard Dagwood, medical adviser to Conde Nast Traveler." -Is Cabin Air Hazardous To Your Health? by Jane E. Stevens, MSNBC. "While the FAA admits there is reason for concern, it pointed out... that the sophisticated filters (on airliners) are the same type used in hospitals. Critics don't find that reassuring, pointing out that.. hospital-acquired viral and bacterial ailments caught by a patient who entered the institution for an entirely different reason, are a major cause of sickness and even death." Is Cabin Air Hazardous To Your Health? by Jane E. Stevens, MSNBC. "Even with ventilation systems running at full capacity, the close quarters in jet cabins put passengers at an unavoidable risk for catching diseases from people sitting nearby... 18 of 34 members of a Navy squadron caught the flu while travelling on a military DC-9, with its all-fresh air ventilating system working perfectly."